Hi my dear blog friends... I have realized at this seaso I can not do the Tuesday Cuppa Tea linky, because of the care of my dear husband ...I am his sole caregiver at the moment...is just not leaving me enough time to ensure I get to visit everyone who so kindly and faithfully leaves a comment or link. The pattern number is 13546, and it was made from 1940-1966 when the pottery closed, but on several different cup shapes. The pattern is called Hulme's Rose Bouquet, named after the Shelley designer who created it...so pretty! The pattern is number 13240 and dates from the same parameters... 1940-1966...made on different shapes during that period. These bowls are so versatile as well as pretty for a tea table! Lemon, teabags, cream, jam.. you name it! I have a lonely Shelley Harebell Low Footed Oleander cream soup that doubles as a dessert bowl. The saucer arrived after a buying trip to England in 4 pieces, but I love the bowl so kept it. And I don'y care if I never find another saucer really! Lol! The pattern number of the cream soup is 13598. And for the custard I am making for the cobbler, a lonely Shelley Bridal Rose or Rose Spray Dainty shape creamer. The sugar bowl was another victim of the shipping from the UK. But again, so versatile and goes with so much! The pattern number on this is 13545, and again a long time of production until the pottery closed in 1966. So there we go... thanks so much for joining me for tea. It helps keep my sanity at the moment... if that's possible! Lol! Have a lovely week and visit some of the wonderful blogs I follow on my sidebar. Hope to have Tuesday Cuppa Tea back soon. and I am content for that to be so! Dear Ruth: You have so carefully explained each piece and delightful details here. The colors are all so very soft and sweet. Blueberries are always delicious! Prayers for you during this challenging time! What lovely tea things! I agree that sometimes we don't need to missing piece to enjoy the cup or bowl! Hang in there. My husband has Parkinson's. What beautiful pieces you've shared, Ruth. I love the gorgeous Shelley teacup, the pretty bow, creamer, and the soup bowl. How pretty they all look on your tea table. God bless you and your hubby, and may Our Heavenly Father give you strength as a caregiver. Prayers are with you. We totally understand, Ruth, that your husband is your top priority right now. Your Shelley pieces blend together beautifully. I've always found mismatched sets charming. I love Shelley, and all their beautiful patterns and shapes. Thanks for reminding me of Psalm 31:15! 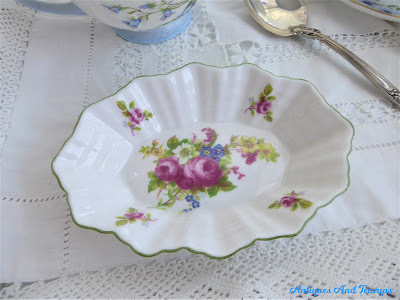 Your Tea tray is adorable!How sweet and dainty your china are!The doily is stunning.God bless your husband and you,dear Ruth!Hugs! What a lovely post, dear Ruth. Your china is ever so beautiful and brought a smile to my face. Hugs! Ruth, we'll all be thinking of you at this difficult time. Being sole caregiver is very taxing, so I hope you will soon find someone to relieve you from time to time; must take care of yourself for both of you! Thank you for sharing the details on your beautiful Shelley pieces. The rituals of tea have always "helped keep my sanity" as well during stressful times. Will be missing you Ruth. Take good care of your husband and yourself. God bless you and keep you!